TED-Ed Weekend 2018: Meet the Speakers! 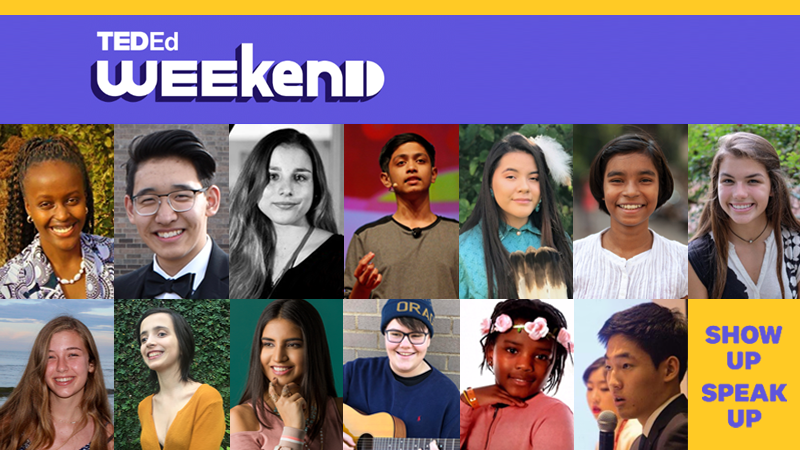 It’s that time again: TED-Ed Weekend will return on November 17th, 2018! This full-day event is designed to amplify the voices of TED’s next generation by inviting students from around the world to share their ideas from the TED stage in NYC. This is TED’s only official event featuring an all-student audience, and every speaker in this year’s lineup is a member of the TED-Ed Student Talks community! TED-Ed Weekend will offer an abundance of inspiring ideas, interactive workshops, and a peek behind the curtain of the TED Headquarters in New York City. Meet the 2018 TED-Ed Weekend Speakers below and in our Speaker video! Esha Alwani is a high school senior in Oranjestad, Aruba who discovered that her love of music helps her tackle the challenges of living with Tourette’s Syndrome. She’s obsessed with composing and performing music and has even shared the stage with superstar Alicia Keys in front of an audience of almost 10,000 people. Esha unwinds from her studies and college applications by watching Friends and laughing at silly jokes. She is excited to continue expanding her horizons in College next year. Ayanda Bokaba is a sixth grade student from Midrand, South Africa. She’s interested in how criticism affects people’s confidence and she hopes that her TED-Ed Talk will inspire people to be comfortable in their own skin. Ayanda is proud of all of her academic achievements and hopes to continue enhancing her drawing skills. Maria Stockler Carvalhosa is an 11th grade student from Rio de Janeiro, Brazil. After partially losing her eyesight and undergoing unsuccessful surgeries, she wanted to share her story through a TED-Ed Talk. Maria is a proud member of her incredible family, and she enjoys singing while playing the piano and guitar as well as laughing endlessly at jokes. Tenzin Choesang is a first-year student at the University of Minnesota. He thinks that we should all spend more time talking to ourselves, and drew inspiration for his Talk from this idea. Tenzin is proud of his Tibetan heritage and of the improvements that he’s made in his confidence. When he’s not busy studying, you can find Tenzin enjoying a funny meme or laughing at Conan O’Brien. Ava Echard is a 10th grade student from Chattanooga, Tennessee. Motivated by her placement into a gifted education program, Ava set out to explore the role of “nature versus nurture” in schools. In addition to binge-watching TED Talks, Ava enjoys painting and savoring a chuckle while watching Saturday Night Live. Sofia Guidi is in her last year of high school in Torino, Italy. She joined her school’s TED-Ed Club because she wanted to overcome her fear of public speaking and now she hopes to spread awareness about the politics of domestic violence in Russia. Sofia enjoys acting in plays with her drama club as well as swimming and watching Grace and Frankie. Leonardo Hamric is a high school sophomore in Columbus, Ohio. For his Talk, he chose the topic of friendship because of its universal relatability. Leo is also a skilled musician — he taught himself how to play five of the six instruments he’s proficient in — and most people don’t know that he’s an excellent baker. Ashiya Kumari is a 7th grade student in Pune, India. She believes that everyone is a teacher on the inside and thus has the power to transform the world. In addition to being a devoted student (and teacher! ), Ashiya likes cooking, knitting, and laughing at quirky science jokes! Curtis Lee is a high school senior in Seoul, South Korea. As the student leader of his TED-Ed Club, he enjoys cultivating an environment where students share valuable ideas. He’s proud to be part of such a passionate and colorful learning community, and is committed to further expanding his Club. Curtis also has an incredible sense of direction, and isn’t intimidated by finding his way in new places. Akash Manoj is a high school senior in Hosur, India. He has been reading medical literature for fun since the eighth grade and is dedicated to developing low-cost healthcare diagnostics. His research on the detection of asymptomatic heart attacks inspired his TED-Ed Talk. When Akash isn’t working on his medical innovations, you can find him on the tennis court or getting lost in a book. Staecey-Merveille Ngabire is a 2nd year Civil Engineer student at the University of Windsor in Canada. She left her war-torn country of Burundi when she was 8 years old and sought out a new home in Ontario with her family. Her faith, family, and education motivate her to confidently face challenges, never give up, and always aim for excellence. In her spare time, Staecey enjoys decorating for special events because it allows her to be creative and think outside the box. Elonna LaFromboise is a high school senior in Edmond, Oklahoma. Her experience supporting the Standing Rock Sioux tribe against the Dakota Access Pipeline inspired her TED-Ed Talk. She is proud of her ancient tribal heritage and hopes to see it preserved and respected. When she isn’t participating in meaningful activism, she can be found nurturing her hidden talent: playing the ukulele. Elaine Russell is a 17 year-old student from Mountain Brook, Alabama. At first she had trouble choosing her TED-Ed Talk topic, but as soon as she settled on it, her Talk practically wrote itself. Elaine is proud of her loyal nature, her work ethic, and her ability to stay calm during tense situations. Applications for this year’s TED-Ed Weekend are now closed, but don’t worry — you will have plenty of opportunities to watch the sessions and connect with the TED-Ed student community on the day of the event! We’ll be streaming this year’s TED-Ed Weekend event live on our Student Talks Youtube channel.